The Buffalo Classics are back! Right in the middle of the 90s-Revival Buffalo London releases its famous sneaker with the unique platform sole. Get ready for the chunky silhouette: the former Spice Girls‘ favourites are finally available online. Don't believe the hype - make it. Under its second label Buffalo London the German brand Buffalo revives the cult shoe with the continuous platform sole a.k.a. cloud sole. Tailored for a young, stylish and urban target group, a team of international designers develops a diverse reinterpretation of the sneakers. Following global trends, the newly launched Buffalo Classics embody an authentic, bold, and provocative style. Buffalo Classics do not follow the paths of established conventions and want to provide their wearers with the opportunity of a powerful look in the spirit of the LGBT movement. The reinterpreted Buffalo Classics have an even lighter cloud sole, which makes walking and dancing with the platform sneakers even more comfortable. Their bulky and chunky size, the retro branding and the wave-like structure remain. Whether in high or low, the new Buffalo Classics are made of high-quality materials such as soft nubuck leather. And a look into the future reveals: That's just the beginning and you can look forward to many more extreme Buffalo Classics design creations like the legendary Hightower. Since the end of 2017, new selected Buffalo Classics models have been released each month in strictly limited editions. Additional collaborations with Junya Watanabe, Patrick Mohr or Opening Ceremony prove how enormous the fashion potential of platform sneakers is. 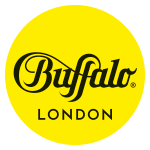 So far, Buffalo Classics were only available for purchase in selected stores worldwide such as Browns, Opening Ceremony, KADEWE or Luisa via Roma. Rediscovered by the international fashion scene, the Buffalo Classics were suddenly trendy again and therefore even suitable for high fashion. Just in time for the Fashion Week, the Buffalo Classics in black, white and beige are now also available in German stores – both online and in our Buffalo stores.